Robinhood is marketed as a commission-free stock trading product but makes a surprising percentage of their revenue directly from high-frequency trading firms. 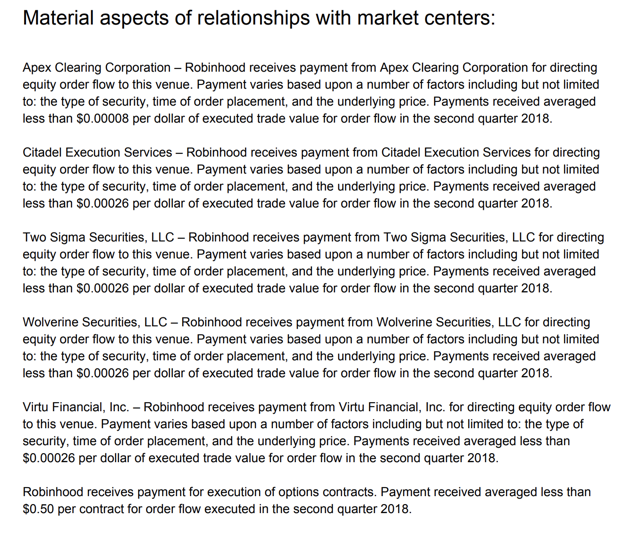 It appears from recent SEC filings that high-frequency trading firms are paying Robinhood over 10 times as much as they pay to other discount brokerages for the same volume. Robinhood needs to be more transparent about their business model. In English folklore, Robin Hood is an outlaw who takes from the rich and gives to the poor. Robinhood was founded to disrupt the brokerage industry by offering commission-free trading. They may not be all that they represent in their marketing, however. The question you should be asking whenever someone in the financial industry offers you something for free is "What's the catch?" And yes, there is typically a catch. After digging through their SEC filings, it seems that today's Robinhood takes from the millennial and gives to the high-frequency trader. 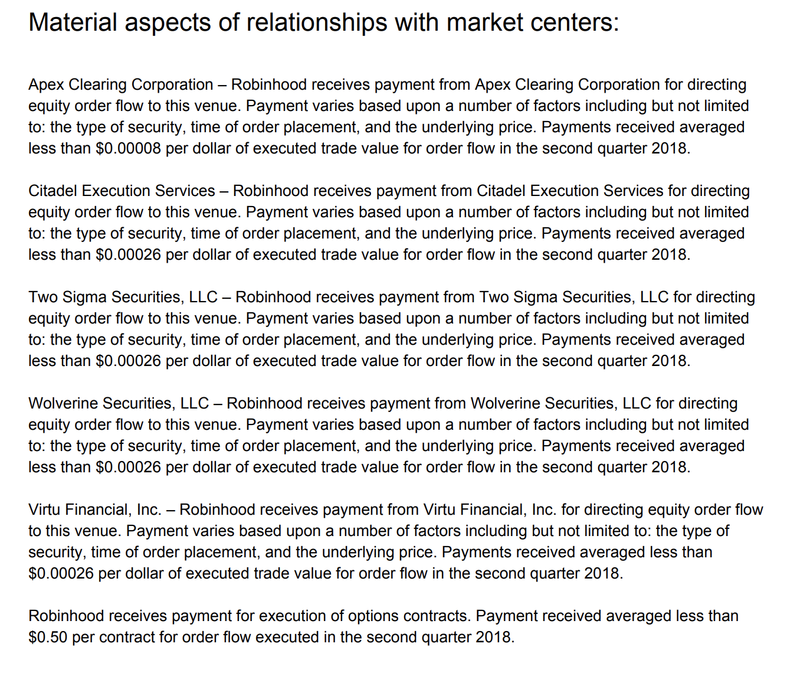 Not only does Robinhood accept payment for order flow, but on a back-of-the-envelope calculation, they appear to be selling their customers' orders for over ten times as much as other brokers who engage in the practice. It's a conflict of interest and is bad for you as a customer. 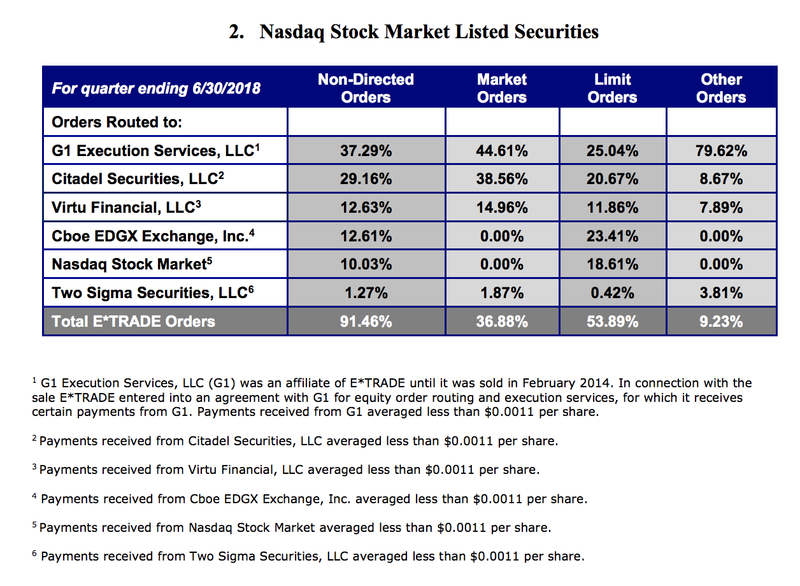 The brokerage industry is split on selling out their customers to HFT firms. Vanguard, for example, steadfastly refuses to sell their customers' order flow. 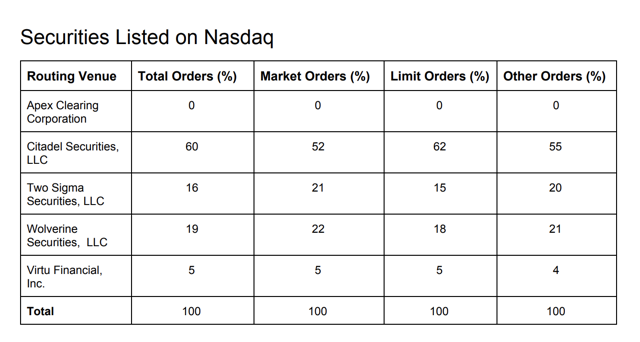 Interactive Brokers (IBKR), which is the preferred broker for sophisticated retail traders, doesn't sell order flow and allows customers to route orders to any exchange they choose. Robinhood not only engages in selling customer orders but seems to be making far more than their competitors from it. Among brokers that receive payment for order flow, it's typically a small percentage of their revenue but a big chunk of change nonetheless. Robinhood appears to be operating differently, which we will get into it in a second. All brokerage firms that sell order flow are required by the SEC to disclose who they sell order flow to and how much they pay. The people Robinhood sells your orders to are certainly not saints. Citadel was fined 22 million dollars by the SEC for violations of securities laws in 2017. Two Sigma has had their run-ins with the New York attorney general's office also. Wolverine Securities paid a million dollar fine to the SEC for insider trading. It's easy to miss, but there is a material difference in the disclosures between what Robinhood and other discount brokers are showing that suggests that something is going on behind the scenes that we don't understand at Robinhood. Compare this with E*TRADE (ETFC). They have client assets of $392.8 billion and make roughly $47 million per quarter selling order flow to HFT. From the latest E*TRADE rule 606 disclosure. TD Ameritrade (AMTD) has client assets of roughly $1.2 trillion and made $119 million last quarter from order flow. From TD Ameritrade's rule 606 disclosure. Look closely here - if you don't, you'll miss it. 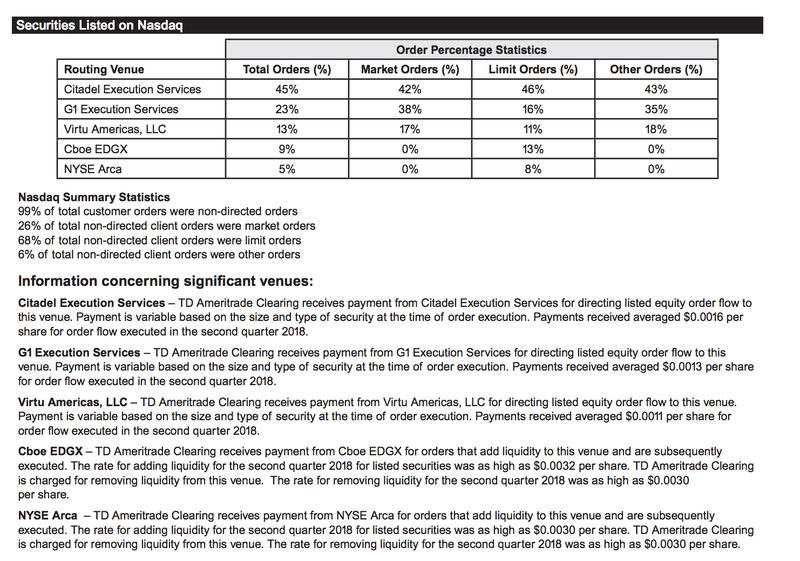 TD Ameritrade and E*TRADE both report their payments for order flow as roughly a tenth of a penny per share. Now, look at Robinhood's SEC filing. They report their figure as "per dollar of executed trade value." This means the number you see in their filing looks smaller if you don't have the filings from their competitors in front of you, but it's actually much higher. Let's do some quick math. Assume the average stock traded has a share price of $50. It takes 20,000 shares traded at $50 for $1,000,000 in volume, for which E*TRADE makes $22 per $1,000,000 traded, which sounds like a small number until you realize they cleared $47,000,000 last quarter from this. But off an identical $1,000,000 in volume, Robinhood gets paid $260 from the same HFT firms. If Robinhood did as much trade volume as E*TRADE, they would theoretically be making close to $500 million per quarter in payments from HFT firms. 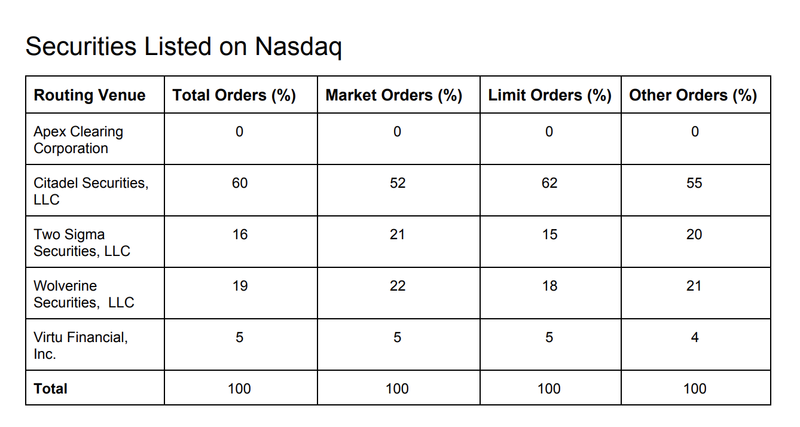 Why are high-frequency trading firms willing to pay over 10 times as much for Robinhood orders than they are for orders from other brokerages? Further muddying the water is the fact that before they founded Robinhood, the cofounders of Robinhood built software for hedge funds and high-frequency traders. Why wouldn't they report how much they are getting paid per share like E*TRADE, TD Ameritrade, or Charles Schwab (SCHW) and instead report per dollar of trade value where the number can look smaller when it's actually ten times as much? I'm not a conspiracy theorist. I'm not even a pessimistic guy. But Robinhood is not being transparent about how they make their money. Every other discount broker reports their payments from HFT "per share", but Robinhood reports "per dollar", and when you do the math, they appear to be receiving far more from HFT firms than other brokerages. This raises questions about the quality of execution that Robinhood provides if their true customers are HFT firms. Robinhood isn't the worst thing to happen to online trading, but they market their service as a free/no-commission product, which has the effect of pushing trade volume through the roof. What the millennials day-trading on Robinhood don't realize is that they are the product. Robinhood is well on their way to making hundreds of millions of dollars in cash income by selling their customers' orders to the HFT meat grinder. High-frequency traders are not charities. The only reason high-frequency traders would pay Robinhood tens to hundreds of millions of dollars is that they can exploit the retail customers for far more than they pay Robinhood. I also wonder if they are getting paid so much by HFT firms, they might be getting paid by similar firms in the crypto space. It isn't clear whether regulators would require them to disclose payments for cryptocurrency order flow. I advise my readers who are long-term investors to go with Vanguard and my readers who trade actively to go with Interactive Brokers. Like what you're reading? Scroll to the top of the page and follow me!